This activity is based on a painting of Abigail Hinman on display at the Lyman Allyn Art Museum in New London, Connecticut. The story of the painting is that Abigail was home in New London while her husband, a sea captain, was away on a voyage. Suddenly, outside of her home, Abigail heard a commotion and witnessed the city of New London being destroyed by red-coated soldiers. 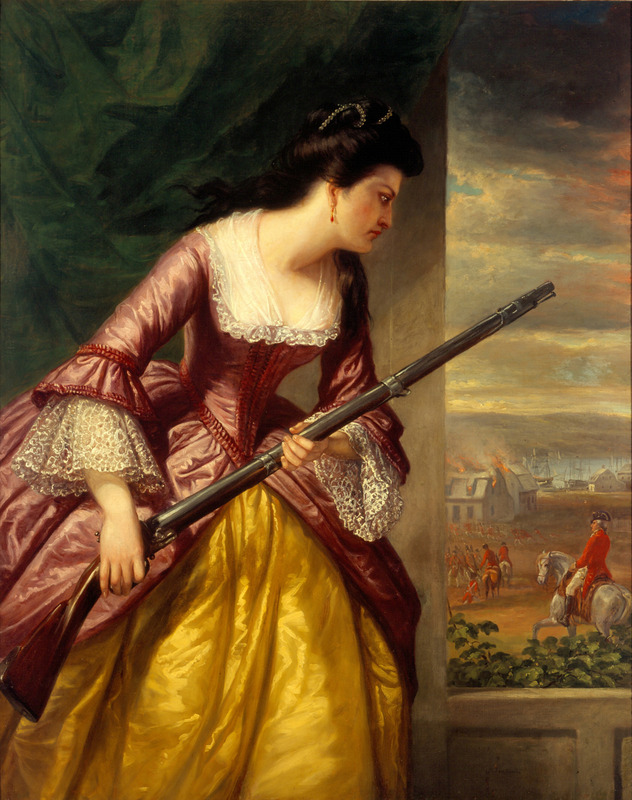 Surprisingly, she saw Benedict Arnold, a family friend from the nearby town of Norwich, was one of the soldiers. He commanded the soldiers to spare her property, but Abigail was not blind to his blatant act of treason. What was Connecticut’s role in the American Revolution? How do museums in Connecticut and elsewhere in New England help us understand the American Revolution? How do museums represent American identity? Are museums trustworthy places to learn about U.S. history? Daniel Huntington, Abigail Dolbeare Hinman, 1854-1856 – Lyman Allyn Art Museum, New London, Connecticut. Have students do a close reading of the image of Abigail. What do students notice about her style of dress, her posture/expression, the background, etc.? What clues are there as to the time period of the image? Where is it? What is going on? as a reenactment — students write a play that retells the story of New London. through a living timeline — students each take a point in the history of the American Revolution and relate what happened in Connecticut on that date. by recreating the scene — students may create a visual representation of the event through a drawing, painting, photograph, video, or even a tableau. A student “voice” should then explain what the image represents to the rest of the class or audience. through a letter — students should write a letter to the editor of the Connecticut Courant (now called the Hartford Courant) explaining what was taking place in New London and what should be done about it. Benedict Arnold Turns and Burns New London by Edward Baker for Connecticut Explored.